As you drive your shiny new Nissan Leaf out of the dealership in silence and zero-emissions cleanliness, it's easy to forget all the resources and energy that have gone into building it. Those are a necessary evil as far as car production goes, but companies like Nissan are doing their best to reduce the environmental impact of production--as Nissan's latest video shows. In "Beyond Zero Emissions", Nissan shows how recycled materials make up a significant proportion of the car's structure. 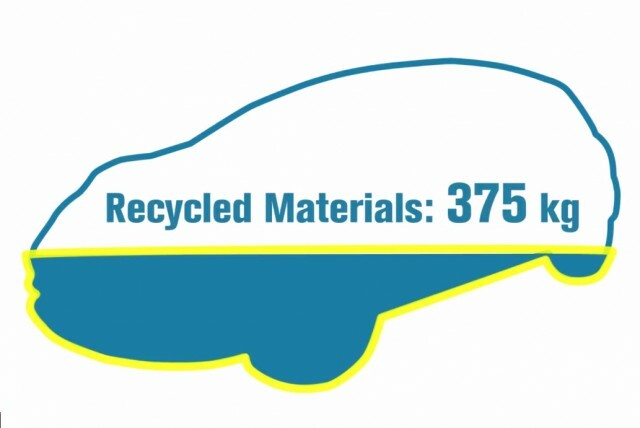 In terms of volume, around a quarter of the weight of a Nissan Leaf has come from recycled materials--everything from the steel body itself to plastic and fabric elements throughout the vehicle. The seats, for example, are formed from a synthetic material made from old PET (Polyethylene terephthalate) soda bottles--commonly used as an industry substitute for polyester. The resin used to form large plastic parts such as the dashboard and door cars is also derived from recycled materials. Under the hood, the car's sound-deadening pads (not that the Leaf needs many with its quiet electric motor) are formed from old recycled clothing. Nissan's video covers the process from start to finish. From clothing hitting recycling firm Nittoku to the resulting fibers being formed into sound insulating panels, it takes just two days. Japanese recycling firm UBE notes another aspect of the process that needs to be in place for such systems to truly work--a start to end agreement between recycling firms and automakers. With such a system in place, waste products will always have a buyer, and the process is rendered more sustainable. MORE: What's Best For Old Electric-Car Batteries: Reuse Or Recycling? And if you're worrying that recycled parts means lower quality, Nissan Leaf Chief Vehicle Engineer, Hidetoshi Kadota assures that recycled components are held to the same high standards as those made from new materials. Hopefully, future iterations of the Leaf and other vehicles will use even greater proportions of recycled parts--but in the meantime, it's reassuring to know the Leaf's environmental impact at a production level is kept as low as possible.